ERG (ETS-related gene) is an oncogene. ERG is a member of the ETS (erythroblast transformation-specific) family of transcription factors. The ERG gene encodes for a protein, also called ERG, that functions as a transcriptional regulator. Genes in the ETS family regulate embryonic development, cell proliferation, differentiation, angiogenesis, inflammation, and apoptosis. Transcriptional regulator ERG is a nuclear protein that binds purine-rich sequences of DNA. Transcriptional regulator ERG is required for platelet adhesion to the subendothelium and regulates hematopoiesis. It has a DNA binding domain and a PNT (pointed) domain. ERG is expressed at higher levels in early myelocytes than in mature lymphocytes (types of white blood cells). Therefore, ERG may act as a regulator of differentiation of early hematopoietic cells. The Mld2 mutation, generated through an ENU mutagenesis screen, was the first non-functional allele of Erg. Homozygous Mld2 is embryonic lethal at day 13.5. Adult mice heterozygous for the Mld2 mutation have hematopoietic stem cell defects. This means that when the ERG gene was not actively transcribed and the ERG protein produced, a mouse's hematopoietic cells were unable to function properly. Since ERG is important to the ability of the hematopoietic cells to function and self-renew, there may be applications in using blood stem cells for tissue repair, transplantation and other therapeutic applications. This gene can be classified as a proto-oncogene. During chromosomal translocations that occur in cell division, ERG can accidentally get stuck onto a different chromosome than where it belongs. This is analogous to another translocation, the Philadelphia chromosome. This results in fusion gene products, which can have bad consequences for cells. Examples of these fusion gene products would be TMPRSS2-ERG and NDRG1-ERG in prostate cancer, EWS-ERG in Ewing’s sarcoma, and FUS-ERG in acute myeloid leukemia. DNA binding protein ERG fuses with RNA binding proteins EWS and TLS/FUS in Ewing's sarcoma and acute myeloid leukemias respectively and function as transcriptional activators. ERG and its fusion proteins EWS-ERG and TLS/FUS-ERG inhibit apoptosis. ERG can fuse with TMPRSS2 protein to form an oncogenic fusion gene that is commonly found in human prostate cancer, especially in hormone-refractory prostate cancer. This suggests that ERG overexpression may contribute to development of androgen-independence in prostate cancer through disruption of androgen receptor signaling. The fusion gene is critical to the progression of cancer because it inhibits the androgen receptor expression and it binds and inhibits androgen receptors already present in the cell. Essentially TMPRSS2-ERG fusion disrupts the ability of the cells to differentiate into proper prostate cells creating unregulated and unorganized tissue. In 90% of prostate cancers overexpressing ERG, they also possess a fusion TMPRSS2-ERG protein, suggesting that this fusion is the predominant subtype in prostate cancer. Ewing's sarcoma is associated with chromosomal translocations, which typically results in fusion genes with transcriptional regulators. This means that the protein transcribes for with the gene could be produced in excess or under- produced resulting in unnatural activity in cells. Typically this is the first step in a cell's progression to malignancy. In about 10% of Ewing's Sarcoma cases have an EWS1-ERG fusion. In acute myeloid leukemia, the t(16;21) translocation in myeloid leukemia fuses TLS/FUS to ERG which disrupts the natural TLS/FUS RNA binding domain, and instead inserting the ERG DNA binding domain. ERG is located on chromosome 21. 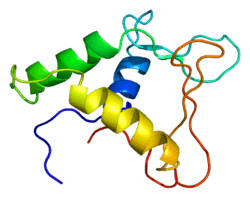 The ERG protein is expressed at a similar level throughout the body. ↑ Reddy ES, Rao VN, Papas TS (Sep 1987). "The erg gene: a human gene related to the ets oncogene". Proceedings of the National Academy of Sciences of the United States of America. 84 (17): 6131–5. doi:10.1073/pnas.84.17.6131. PMC 299022 . PMID 3476934. 1 2 Rao VN, Papas TS, Reddy ES (Aug 1987). "erg, a human ets-related gene on chromosome 21: alternative splicing, polyadenylation, and translation". Science. 237 (4815): 635–9. doi:10.1126/science.3299708. PMID 3299708. ↑ Rao VN, Modi WS, Drabkin HD, Patterson D, O'Brien SJ, Papas TS, Reddy ES (Nov 1988). "The human erg gene maps to chromosome 21, band q22: relationship to the 8; 21 translocation of acute myelogenous leukemia". Oncogene. 3 (5): 497–500. PMID 3274086. ↑ Reddy ES, Rao VN (Dec 1991). "erg, an ets-related gene, codes for sequence-specific transcriptional activators". Oncogene. 6 (12): 2285–9. PMID 1766675. ↑ Siddique HR, Rao VN, Lee L, Reddy ES (Jul 1993). "Characterization of the DNA binding and transcriptional activation domains of the erg protein". Oncogene. 8 (7): 1751–5. PMID 8510921. ↑ Murakami K, Mavrothalassitis G, Bhat NK, Fisher RJ, Papas TS (Jun 1993). "Human ERG-2 protein is a phosphorylated DNA-binding protein--a distinct member of the ets family". Oncogene. 8 (6): 1559–66. PMID 8502479. ↑ Loughran SJ, Kruse EA, Hacking DF, de Graaf CA, Hyland CD, Willson TA, Henley KJ, Ellis S, Voss AK, Metcalf D, Hilton DJ, Alexander WS, Kile BT (Jul 2008). "The transcription factor Erg is essential for definitive hematopoiesis and the function of adult hematopoietic stem cells". Nature Immunology. 9 (7): 810–9. doi:10.1038/ni.1617. PMID 18500345. ↑ Taoudi S, Bee T, Hilton A, Knezevic K, Scott J, Willson TA, Collin C, Thomas T, Voss AK, Kile BT, Alexander WS, Pimanda JE, Hilton DJ (Feb 2011). "ERG dependence distinguishes developmental control of hematopoietic stem cell maintenance from hematopoietic specification". Genes & Development. 25 (3): 251–62. doi:10.1101/gad.2009211. PMC 3034900 . PMID 21245161. 1 2 Ohno T, Ouchida M, Lee L, Gatalica Z, Rao VN, Reddy ES (Oct 1994). "The EWS gene, involved in Ewing family of tumors, malignant melanoma of soft parts and desmoplastic small round cell tumors, codes for an RNA binding protein with novel regulatory domains". Oncogene. 9 (10): 3087–97. PMID 8084618. 1 2 Prasad DD, Ouchida M, Lee L, Rao VN, Reddy ES (Dec 1994). "TLS/FUS fusion domain of TLS/FUS-erg chimeric protein resulting from the t(16;21) chromosomal translocation in human myeloid leukemia functions as a transcriptional activation domain". Oncogene. 9 (12): 3717–29. PMID 7970732. ↑ Yi H, Fujimura Y, Ouchida M, Prasad DD, Rao VN, Reddy ES (Mar 1997). "Inhibition of apoptosis by normal and aberrant Fli-1 and erg proteins involved in human solid tumors and leukemias". Oncogene. 14 (11): 1259–68. doi:10.1038/sj.onc.1201099. PMID 9178886. 1 2 3 Yu J, Yu J, Mani RS, Cao Q, Brenner CJ, Cao X, Wang X, Wu L, Li J, Hu M, Gong Y, Cheng H, Laxman B, Vellaichamy A, Shankar S, Li Y, Dhanasekaran SM, Morey R, Barrette T, Lonigro RJ, Tomlins SA, Varambally S, Qin ZS, Chinnaiyan AM (May 2010). "An integrated network of androgen receptor, polycomb, and TMPRSS2-ERG gene fusions in prostate cancer progression". Cancer Cell. 17 (5): 443–54. doi:10.1016/j.ccr.2010.03.018. PMC 2874722 . PMID 20478527. ↑ Tomlins SA, Laxman B, Varambally S, Cao X, Yu J, Helgeson BE, Cao Q, Prensner JR, Rubin MA, Shah RB, Mehra R, Chinnaiyan AM (2008). "Role of the TMPRSS2-ERG gene fusion in prostate cancer". Neoplasia. 10 (2): 177–88. doi:10.1593/neo.07822. PMC 2244693 . PMID 18283340. ↑ Ichikawa H, Shimizu K, Hayashi Y, Ohki M (Jun 1994). "An RNA-binding protein gene, TLS/FUS, is fused to ERG in human myeloid leukemia with t(16;21) chromosomal translocation". Cancer Research. 54 (11): 2865–8. PMID 8187069. ↑ Verger A, Buisine E, Carrère S, Wintjens R, Flourens A, Coll J, Stéhelin D, Duterque-Coquillaud M (May 2001). "Identification of amino acid residues in the ETS transcription factor Erg that mediate Erg-Jun/Fos-DNA ternary complex formation". The Journal of Biological Chemistry. 276 (20): 17181–9. doi:10.1074/jbc.M010208200. PMID 11278640. ↑ Basuyaux JP, Ferreira E, Stéhelin D, Butticè G (Oct 1997). "The Ets transcription factors interact with each other and with the c-Fos/c-Jun complex via distinct protein domains in a DNA-dependent and -independent manner". The Journal of Biological Chemistry. 272 (42): 26188–95. doi:10.1074/jbc.272.42.26188. PMID 9334186. Yi H, Fujimura Y, Ouchida M, Prasad DD, Rao VN, Reddy ES (Mar 1997). "Inhibition of apoptosis by normal and aberrant Fli-1 and erg proteins involved in human solid tumors and leukemias". Oncogene. 14 (11): 1259–68. doi:10.1038/sj.onc.1201099. PMID 9178886. Rao VN, Papas TS, Reddy ES (Aug 1987). "erg, a human ets-related gene on chromosome 21: alternative splicing, polyadenylation, and translation". Science. 237 (4815): 635–9. doi:10.1126/science.3299708. PMID 3299708. Giovannini M, Biegel JA, Serra M, Wang JY, Wei YH, Nycum L, Emanuel BS, Evans GA (Aug 1994). "EWS-erg and EWS-Fli1 fusion transcripts in Ewing's sarcoma and primitive neuroectodermal tumors with variant translocations". The Journal of Clinical Investigation. 94 (2): 489–96. doi:10.1172/JCI117360. PMC 295111 . PMID 8040301. Dunn T, Praissman L, Hagag N, Viola MV (Aug 1994). "ERG gene is translocated in an Ewing's sarcoma cell line". Cancer Genetics and Cytogenetics. 76 (1): 19–22. doi:10.1016/0165-4608(94)90063-9. PMID 8076344. Ichikawa H, Shimizu K, Hayashi Y, Ohki M (Jun 1994). "An RNA-binding protein gene, TLS/FUS, is fused to ERG in human myeloid leukemia with t(16;21) chromosomal translocation". Cancer Research. 54 (11): 2865–8. PMID 8187069. Prasad DD, Rao VN, Lee L, Reddy ES (Feb 1994). "Differentially spliced erg-3 product functions as a transcriptional activator". Oncogene. 9 (2): 669–73. PMID 8290279. Duterque-Coquillaud M, Niel C, Plaza S, Stehelin D (Jul 1993). "New human erg isoforms generated by alternative splicing are transcriptional activators". Oncogene. 8 (7): 1865–73. PMID 8510931. Basuyaux JP, Ferreira E, Stéhelin D, Butticè G (Oct 1997). "The Ets transcription factors interact with each other and with the c-Fos/c-Jun complex via distinct protein domains in a DNA-dependent and -independent manner". The Journal of Biological Chemistry. 272 (42): 26188–95. doi:10.1074/jbc.272.42.26188. PMID 9334186. Carrère S, Verger A, Flourens A, Stehelin D, Duterque-Coquillaud M (Jun 1998). "Erg proteins, transcription factors of the Ets family, form homo, heterodimers and ternary complexes via two distinct domains". Oncogene. 16 (25): 3261–8. doi:10.1038/sj.onc.1201868. PMID 9681824. McLaughlin F, Ludbrook VJ, Kola I, Campbell CJ, Randi AM (Dec 1999). "Characterisation of the tumour necrosis factor (TNF)-(alpha) response elements in the human ICAM-2 promoter". Journal of Cell Science. 112 (24): 4695–703. PMID 10574717. Verger A, Buisine E, Carrère S, Wintjens R, Flourens A, Coll J, Stéhelin D, Duterque-Coquillaud M (May 2001). "Identification of amino acid residues in the ETS transcription factor Erg that mediate Erg-Jun/Fos-DNA ternary complex formation". The Journal of Biological Chemistry. 276 (20): 17181–9. doi:10.1074/jbc.M010208200. PMID 11278640. Yang L, Xia L, Wu DY, Wang H, Chansky HA, Schubach WH, Hickstein DD, Zhang Y (Jan 2002). "Molecular cloning of ESET, a novel histone H3-specific methyltransferase that interacts with ERG transcription factor". Oncogene. 21 (1): 148–52. doi:10.1038/sj.onc.1204998. PMID 11791185. Mackereth CD, Schärpf M, Gentile LN, McIntosh LP (Sep 2002). "Chemical shift and secondary structure conservation of the PNT/SAM domains from the ets family of transcription factors". Journal of Biomolecular NMR. 24 (1): 71–2. doi:10.1023/A:1020617426325. PMID 12449421. Matsui Y, Chansky HA, Barahmand-Pour F, Zielinska-Kwiatkowska A, Tsumaki N, Myoui A, Yoshikawa H, Yang L, Eyre DR (Mar 2003). "COL11A2 collagen gene transcription is differentially regulated by EWS/ERG sarcoma fusion protein and wild-type ERG". The Journal of Biological Chemistry. 278 (13): 11369–75. doi:10.1074/jbc.M300164200. PMID 12554743.